OK. I admit it. I like cowboy hats. I own a couple… well, now, three. The first is probably the coolest because it’s very old. I scored it off eBay a few years back after becoming semi-obsessed with custom hats and then realiziing how much one of those puppies costs. Lacking the funds for a hat constructed to fit the exact contours of my own twisted cranium, I started hunting around. I liked the late-60s Clint Eastwood hats – a little less cowboy – no unsightly pinches – flat brims – rounded crowns with flat “mesa” tops. My favorite was the hat Eastwood wore in 1985’s “Pale Rider.” Black, like a short tophat with a wide, flat brim. Very cool. Also very uncommon. The hat I ended up with was more like the one he wore in 1968’s “Hang ‘Em High.” Similar to the Pale Rider hat but grey (or “silverbelly,” in cow-haberdasher nomenclature) and with a trough around the crown instead of a flat top. I love the thing. On a rainy day, it’s better than a raincoat. (And it keeps the driplets off me glasses.) It cost $40. Plus shipping. I wear it when my hair is dirty, or when it’s precipitating, or when I just want to hear stupid Virginians make fun of a hat they’d never have the balls to try and pull off. The second cowboy hat is a typical festival bent straw rodeo clown sort of get up that I got for $20 at–you guessed it–a festival. Floyd Fest, to be precise. It’s lightweight and easy to wear and I schlep it all over the place. But once in Idaho – or Wyoming, even better – well, the bug caught up to me again. I wanted a nice cowboy hat. I had a little money and I knew there was a custom hatmaker in trendy central Jackson. Jackson, Wyoming (or Jackson Hole, as it’s known) is the nicest tourist trap you’ll ever see. Squeaky clean with wood boardwalks and western storefronts looking over lovely art galleries (shootout in the main square at 6:15 Mon-Sat), it’s the kind of place where tourists are easily recognizable by their out-of-character brand new cowboy hats. Yikes! Screw it. I wanted a hat, and I was not to be detered by a bunch of trendoid boneheads. At least I’ll wear mine when I get back home. Besides, the northwest states are the kind of place where a wide-brinned hat is almost necessary. Intermittent showers are regularly pierced by intense sunlight. A hat is just sensible defense from the elements. So to Jackson Hole Hat Company I went. I tried on a few. Now, I’m no cowboy. I’m about as suburban as a white boy can be. Grew up in northern Virginia and south Kansas City, Missouri. I’ve spent time in the boonies – relatives out there – but I’ve pretty much always lived within biking distance of a major university my entire adult life. I’m fine with that. But I like nice hats. 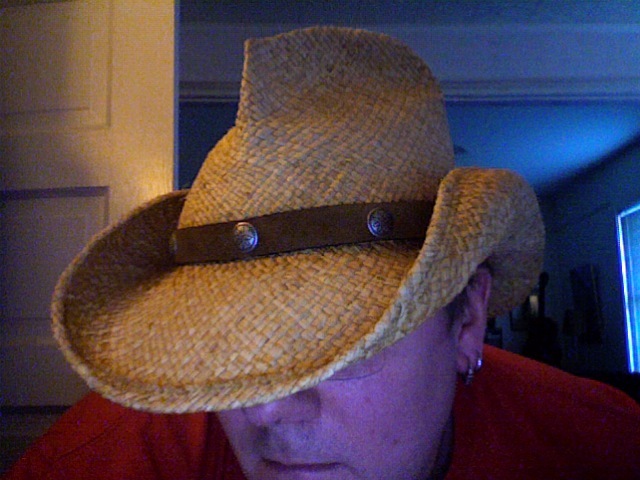 (Some men want watches…) This one, however, would hopefully be something even less cowboy than my other two hats. Custom hats are made of felt derived from the fur of real critters. Rabbit is cheapest and most common, running about $275-ish without a hatband. Next comes a mixture of rabbit and beaver, more than doubling the cost of the hat. Beaver is most prized and the material that many traditional cowboy hats were made from. A new custom beaver hat should push up towards $1000. Often much more. Two days later, it hit me again. After a few hours driving aroung in Grand Teton National Park, through rain and grey, we popped over to sunny Jackson Hole. Dragging my crew of friends behind, I re-entered Jackson Hole Hat Company. It only took a few minutes. I could only afford and fit into a couple hats. Bad choices were instantly registered on my girlfriend’s face, so choosing was easy. 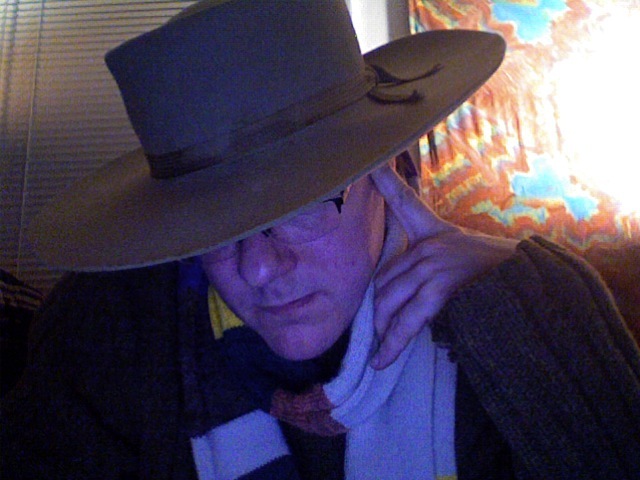 I emerged from the custom room with a chocolate brown wide brim rabbit felt cowboy with sort of a tall fedora crown. “This’ll work,” I thought. It fit snug but comfortably on my head. If I’d had a few more days to kill, they would certainly have shaped it to my exact noggin for me. But this wasn’t necessary. The fit was great, it felt great, and other than begging me to grow a long goatee, it looked pretty good on me. Of course, back in Virginia – like Jackson Hole – you look like an idiot in a cowboy hat unless you… you know: ARE A COWBOY. Whatever. Charlottesville likes to think it knows something about fashion, but it never has. Luckily I’ve always been happy looking like a complete idiot, skeptics be damned, so to hell with it. 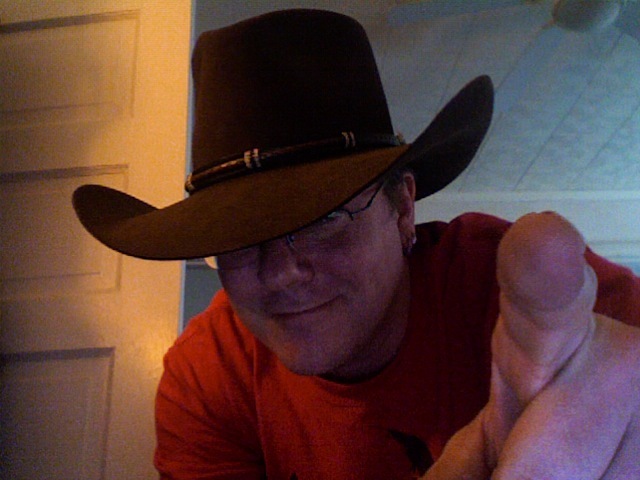 I’m no cowboy, I’m not fronting, and I like this hat. Ta da! Now if it would just rain so I can break it in properly. This entry was posted on June 19, 2008 at 4:45 pm and is filed under cripsyduck with tags cowboy hats, jackson hole, wyoming. You can follow any responses to this entry through the RSS 2.0 feed. You can leave a response, or trackback from your own site. If I had known at the time that the look on my face was so influential, I think I would have done some things differently. I like the hat. I’m likin’ the long distance rantings and ravings, my brother. Just like beenin’ on the back porch. I just need a bloody. Good to hear from you, Scooby. Keeping it right as always, I see. Keep churnin’, good buddy, there’s butter in there somewhere. FYI – some lady on e-bay is offering to send me the hat off your head for 30 bucks. Rob, 30 bucks?! I’d say she’s asking too much. Those are unauthorized Cripsy Duck knock-offs! Buyer beware! That’s ridiculous, Bobby. There’s no way I’d get 30 bucks for that hat – any idea what cats are going for these days? WE ARE NOT AUCTIONING OFF MY CATS!